Unfortunately, the last weeks haven't seen me birding very often. Nevertheless, the migration season takes place normally at the moment, though there is few special to report about. Waders are right now passing through, yet there aren't many suitable resting areas, because on the one hand the water level is high again and on the other hand many actually "good" sites have lost in value over the last years, since vegetation has settled down on the sandbanks. Perhaps a juvenile Mediterranean Gull is worth mentioning, which is now resting for almost a month on the Röckelein Baggersee. However, the great thing of autumn migration is that almost anything can happen in this time. This is pretty much what I've thought when read last week of a Black-winged Kite that had been spotted near the village Burgbernheim last week. The elegant raptor, roughly as big as a falcon, is normally found in North Africa and Spain. Therefore it is an extreme rarity in Central Europe and the wish to see this bird once so close to my home was understandably big. Yet it took a whole week until I could afford to drive the 90 km to Burgbernheim. 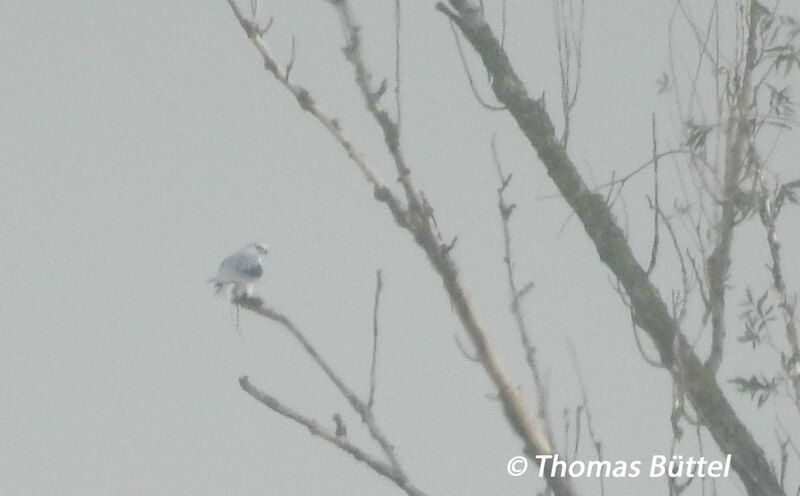 Fortunately, the bird stayed and offered nice scope views despite of the large distance and the resistant fog.